Apply promo code at cart. Must be logged in to redeem. Gift cards, clearance, flash sale, HYLETE project and other discounted items are excluded from this offer. Code expires 10/22/17. Form meets function. 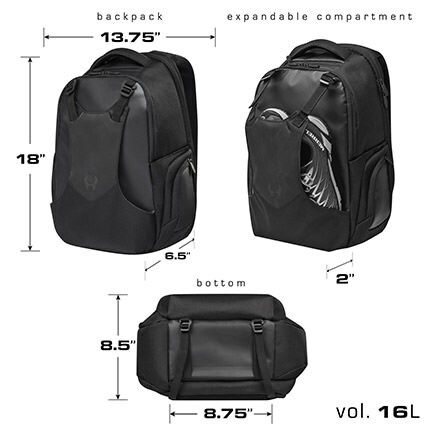 The sleek design lines found on the icon daypack discreetly conceal a myriad of thoughtful features including an external expandable yoke pocket that adapts easily to hold a second pair of shoes, bike helmet, or your choice of accessory. Perfect for your weekend adventure, busy work week, and everything in between. External yoke pocket: Compartment expands to securely stow large items (shoes, helmets, boxing gloves, etc). Insulated Hot/Cold Pockets: keeps your shakes and meals at the perfect temperature. Internal front organizer: Quick access with multiple compartments to keep your smaller items well organized and easy to find. Wet/dry storage sack: Removable stuff sack provides a separation for dirty laundry or to keep items isolated. Stows easily in external yoke pocket. Bottom Accessory Straps: Quick release straps on the base of the daypack provide an additional carrying option for larger items such as a yoga mat or foam roller. Straps easily hide away when not in use. Velour Lined Pocket: Separate your valuables from the main compartment to keep them safe while not in use. Quick access pocket: Thoughtfully placed side pocket provides quick access to your phone or wallet while bag remains slung over shoulder. Laptop Pocket: Padded, soft-lined, side access laptop pocket provides safe storage and easy access.